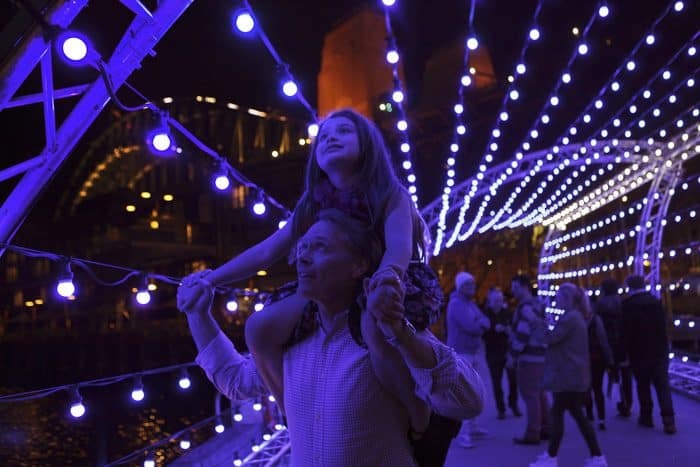 Vivid Sydney starts on Friday 24th May and runs 15th Jun 2019. It’s absolutely huge, the biggest festival in Australia, indeed. With more venues, and running over four weekends… there’s masses to see and do. In fact – too much! Where to start? How to end? And how can we manage when we take kids with us? 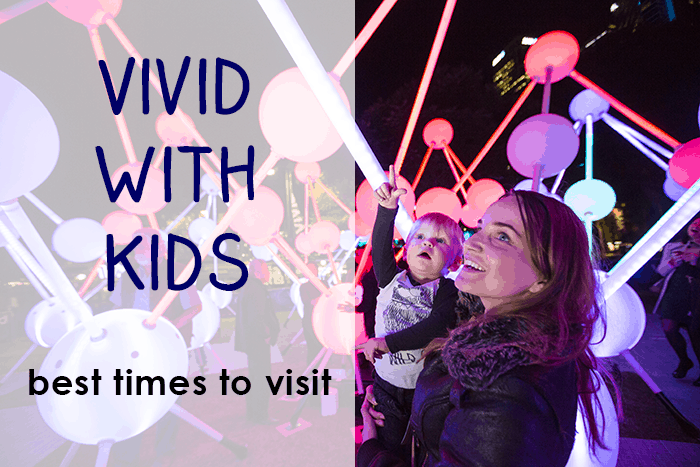 Now, I have to admit that I’ve had some not-so-great experiences of Vivid with my younger children. I was going to call this post ‘Surviving Vivid With Kids’ then told myself to get a grip and be positive. 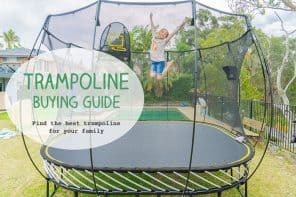 Having lived and learned from my rooky mistakes, I’m hoping this post will help other parents avoid them. I enlisted the support of my lovely Facebook page followers and have lots of advice from them too. First of all… let’s look at the problems. PS One of the ways that works well for some families is to do a Vivid Harbour Cruise. These can be pricy but check out the great deals current on Scoopon here. For me, it’s being stuck in crowds and feeling hemmed in and, at worst, in danger of being crushed. That’s just scary. Paula: Honestly the area around Circular Quay is a nightmare every year but particularly in the last week. Emma: I went last year with a 6yr old and a 3yr old. The best advice I can give is – don’t go early in the early days and take food with you or eat before you go. It was like New Years Eve without the booze. It was totally CRAZY!! We couldn’t get our stroller out of the train station. Make sure you eat dinner before you go because the only cafes open are at Circular Quay and you won’t even get in the door. That or you pay premium at Martin Place at a five star restaurant in the Post Office building. The only budget options open at night time were Mc Donalds and Hungry Jacks and the lines were out the door. There were people sitting in the gutters eating as there was no seating in the street. There was garbage everywhere and it was like we were having a food shortage and the only place open was Macca’s!!!! It was quite distressing for the kids. Especially if you need to take a stroller or a wheelchair, Monday Tuesday and Wednesday are your best friends. Avoid Friday and Saturday like the plague. The sun sets before 5pm in Sydney at the moment. Most of the Vivid lights come on at 6pm however at Taronga Zoo and in Chatswood they start at 5.30pm. So pack up the kids and get onto public transport in the afternoon and be there for the moment the lights pop on. Avoid the queues! I’m thinking of going into the city on the bus one night after school pickup. Quick change in the car, in on the bus, something to eat and then a wander to see the shows. The twins and I once hopped on a ferry and went to see the Vivid lights on an evening of pelting rain. I was really worried that the umbrellas would be a liability but in fact we were fine as there were few brave souls out. But the lights looked amazing, reflected in the wet pavements, all glistening and glorious. There are so many different installations and venues that it’s madness to try to pack too much in. Better to go a couple of times. The transport costs might add up but the lights are free, after all. Little and often is my motto… for Vivid… for chocolate and … for other things too. 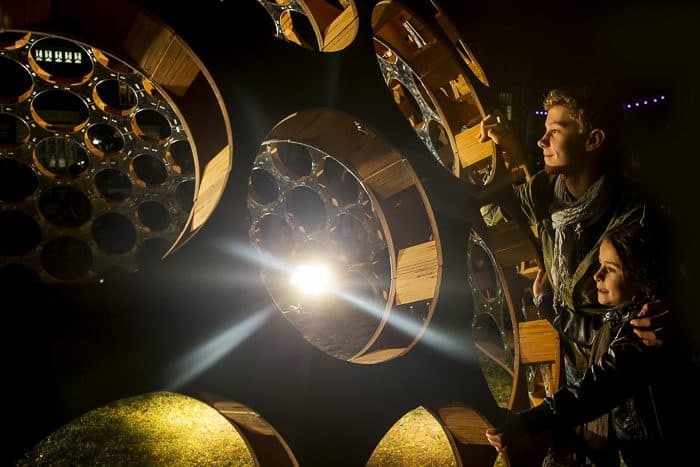 Vivid Sydney 2015, Mirador, The University of Sydney. 25/5/2015. Download the Vivid smartphone app or do your research at www.vividsydney.com, where you can download maps to print. There are some great food trucks around but you can’t always rely on being able to buy food. We would have died of starvation waiting in the long queues last year. As ever with kids, take snacks and drinks! Always the best way to do it and there are lots of extra buses, trains and ferries on offer. The Tripview app is your best friend. Last year my wee girl and I joined some friends who were dropped off at Milsons Point. We walked over the Bridge which was just magical in itself. Then we walked down to the Rocks. We came unstuck there as it was SO busy and crowded, we didn’t stay long really before walking back. That was tiring for Ms9-at-the-time but the views from up there were fabulous. Four Pairs of Itchy Feet: Concentrate on one area. VIVID is massive but is in pockets across the city. Check days that specific events are on. Darling Harbour Family light area is only operating Thursday to Sunday. If travelling in by car, book a car space early near the areas you want to see so the kids are not walking to much. Every night is busy. Family friendly times are early. I recommend either travel on a Tuesday or Wednesday night. We can’t wait to see the new exhibits like the Botanical Gardens, Darling Harbour and even the Zoo looks spectacular. 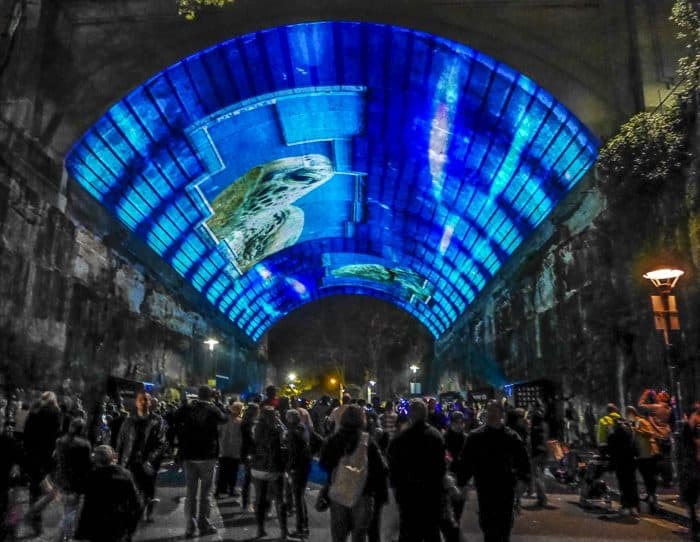 Tickets to VIVID at the Zoo are now on sale. Yes, we hate crowds. Its a massive night and the kids love it however, its usually a day off school to recoup. Emma: Go after 9pm after some of the crowds have dispersed. It is much more civilized then. We will make sure we arrive after 9pm this year. 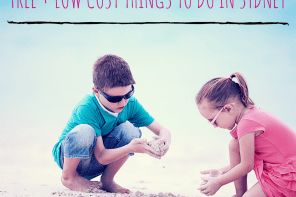 Its kind of the opposite thing to do when you have young kids but it will be better for our sanity this year!! Belinda: If you can use a backpack or pouch for little ones it is much better. Strollers are a nightmare. Don’t leave it till the last weekend, as everyone rushes in that weekend (especially if a couple of weekends have been rainy). Oh and we have booked a table at a Chinese restaurant for dinner the night we are going this year. There are plenty of places to eat up towards Town Hall/Chinatown. We just eat up there, then head to the light after. 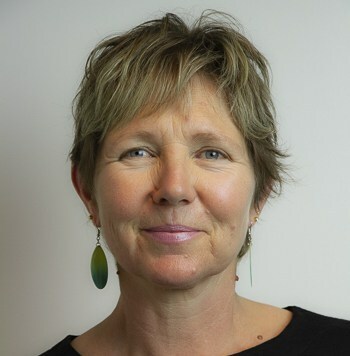 Paula – Sydney Expert: I would suggest taking the glass elevator up to the Cahill expressway and viewing the MCA from there. Great view and usually almost no people. The road is fenced so that helps too. Also the viewing platform from the Overseas Passenger Terminal (there is a lift by Quay restaurant) is a good spot to watch the Opera House from. You can also go around to Walsh Bay – there were not many people around there and the western side of the bridge looked great reflected into the harbour. Central Park also did not have the same crowds. Martin Place is busy early with office workers and the zoo might not be too bad due to the entry cost. Consider taking a ferry around to Darling Harbour – you get to view the Opera House and a nice view back from Milson’s Point. Also it is on for 3 weeks so perhaps don’t try to do too much at once. Shabnam: I don’t recommend coming early,as 6pm lights turn on. That is the time where all the big herd of crowds come in. I recommend coming next week Mon-Wednesday, these usually are the quieter nights. The time I recommend is around 8-10pm,because if your are in the city around 5-7pm,there will be far too many people. Wear very warm clothing as it is extremely cold & windy in the city. The Botanic Gardens, SOH & Circular Quay are good areas to see all the light displays..Martin Place & Darling Harbour should be done on another night, as too much walking might tire the kiddies. 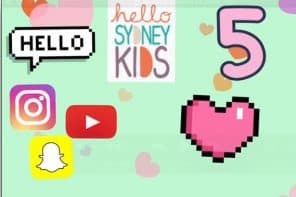 Cristin: We really enjoyed Chatswood for families last year. Of course, nowhere near the amount of installations, but the crowds were so manageable down Victoria Avenue. Then we grabbed some dinner from one of the street vendors and made a picnic of it on The Concourse lawn where they had a moving display on the big screen. As well as the lights, there’s music and action at Vivid. 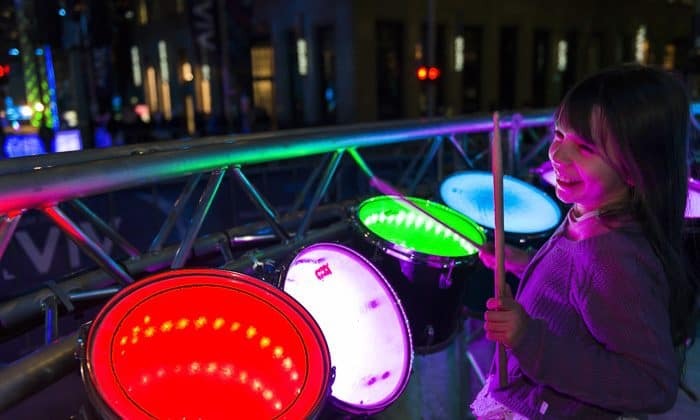 The Vivid Ideas festival has plenty of events for children. There’s also Vivid Music… but I can’t go there… there’s already too much on! Last word: write your phone number on your child’s hand or wrist… just in case. 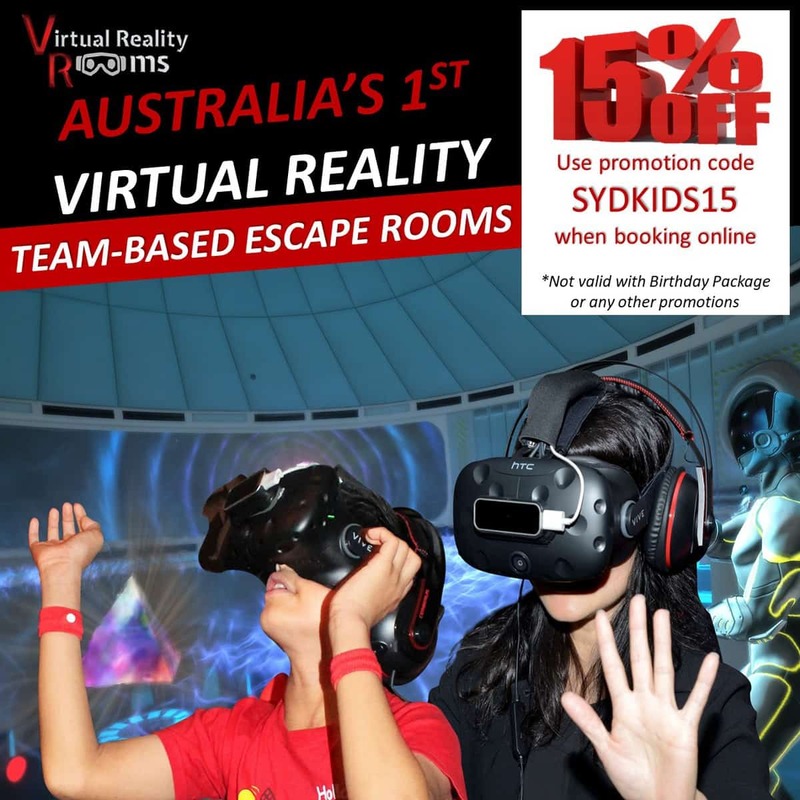 What about you, will you take the kids to Vivid? Might you treat yourself and do an adults-only trip too? Happy planning – where’s that app? 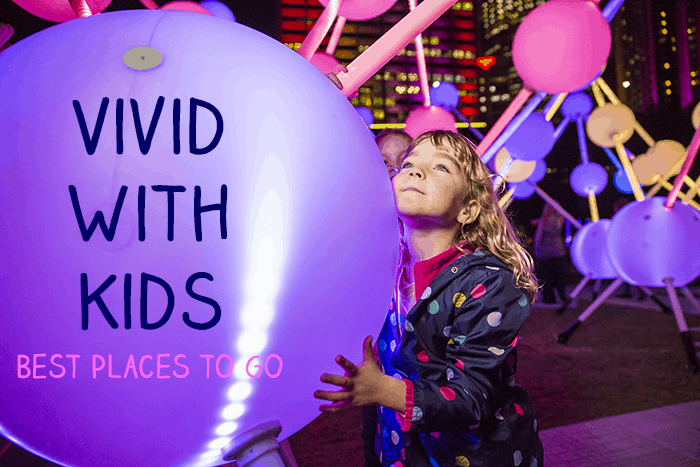 Please do add your comments and help other families plan trips to Vivid. Image credits: Vivid Sydney kindly provided several images, others (the not-so-good-ones) were taken by me over the years. Oops – we are going in this Saturday night right at peak time! Oh well. Actually we are going on a Vivid Cruise on a tall ship (cheap tix via Cudo), which includes dinner, so I’ll let you know how it goes. Actually that sounds like a good way to do it in fact. What a cool plan. So long as you can get to the ship OK. Do pop back and say how it went and link a post if you are writing one. I’d love to do a boat trip as long as it left from the North Shore – Manly ferry maybe? 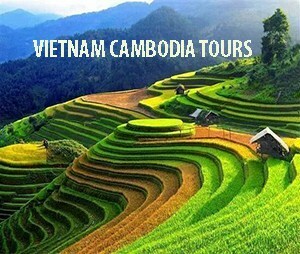 Chech trip planner. We had trouble getting in on the ferry as the northern train line had track work and the ferries home stopped about 9.30 from memory. The transport was a nightmare, so crowded. Getting home they even handed out passes to get on the ferry even if you already had a ticket. One family missed two ferries because it was so chaotic they kept changing the side the ferry left from and they couldn’t get on. Not going this year. It’s scary to be down at the ferries with huge crowds, bad enough when just with adults but terrible with kids. I use the Tripview app a lot and find it helpful… but must say we will only be going on weekdays to the city. Wow what some great tips Seanna. 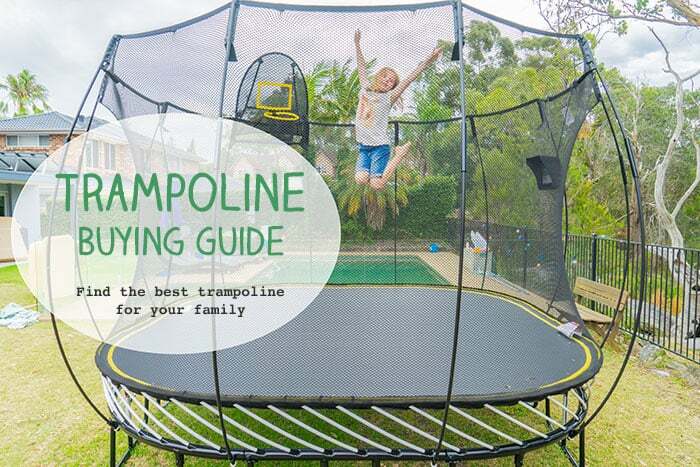 So in depth and very useful even if you’re travelling without kids. Vivid looks so very exciting, worth a bit of hassle and feeling hemmed in by crowds. It’s great to start seeing photos appearing on facebook and Instagram, looking forward to seeing the lights in real life too.